Ostivone™ has been clinically shown to support bone mineral density, assist the body in slowing bone loss, and support the benefits of taking calcium. * This nutrient is scientifically known as ipriflavone, part of the bioflavonoid family of compounds commonly found in plants. Magnesium is a key mineral for maintaining bone tissue. The body makes use of magnesium in its metabolism of calcium. Most of us are aware of the need to plan for retirement. Wisdom dictates that we set aside a little with each paycheck so we will have funds to draw on after we stop working. The same concept applies when looking ahead to our health in retirement years. In fact, we can think of our bones as a savings account. Our accounts contain only as much bone mass as we deposit. The critical years for building bone mass are from prior to adolescence to about age 30 – but no matter where we are in life, taking steps now to increase bone health will allow us to stand taller and firmer in our senior years. As a person ages, bone resorption (loss of calcium from bones) tends to accelerate to make up for decreased calcium intakes. Osteoporosis, or brittle-bone disease, is caused by inadequate dietary intake and absorption of calcium, which results in increased bone resorption. Q. If I am already experiencing the first signs of osteoporosis, should I still supplement with this product? A. Your doctor would have you increase your calcium intake as part of your treatment protocol. Consult with your health care professional to find out if this product is right for you. Q. Isn’t it too late to improve bone health after the age of 30? A. It’s never too late to attempt to remineralize lost bone density. Q. If I take this product, but I don’t do any kind of exercise, will it still help me? A. 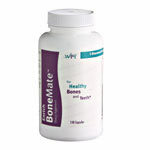 The BoneMate formulation is meant to aid in the deposition of calcium into bone regardless of physical exercise.